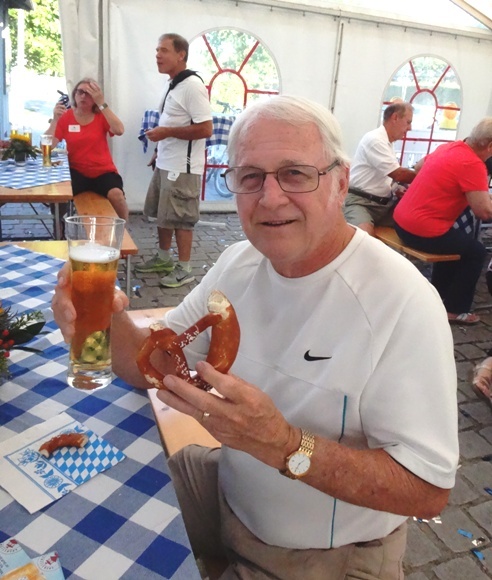 One of the most delightful stops on our Danube River cruise on AmaSerena was Vilshofen, Germany. The town lies on the edge of the southern Bavarian Forest where the rivers Vils and Woffach flow into the Danube. That location has given it the name of “three-river city.”Another claim to fame is that Vilshofen is where beer was first brewed using the “pilsner” method. Walking to the rivers and the old town is easy because it’s located just steps from the dock. 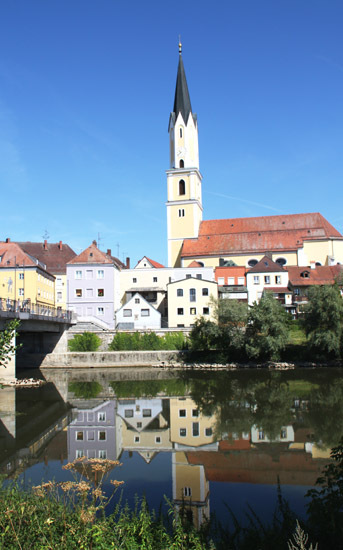 Take time to stroll in the historical center, noting sculptures and the tall 17th century tower of City Hall. Look for dates on buildings and consider stopping to see the gallery at City Hall and ornate St. John the Baptist Catholic Church. The most imposing structure is the Benedictine abbey of Schweikberg, with its twin towers overlooking the town, although we didn't go there. Located above town on a hill, today 40 monks live in the monastic community. 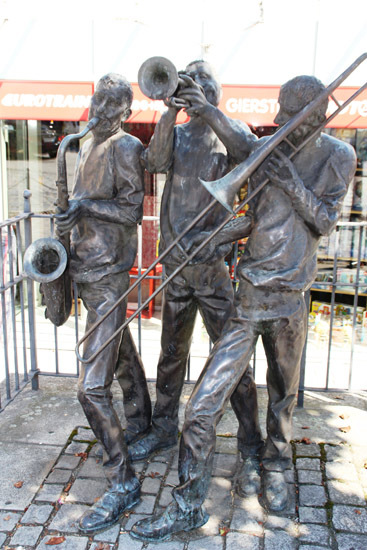 "Jazz" sculpture in Vilshoften, Germany. 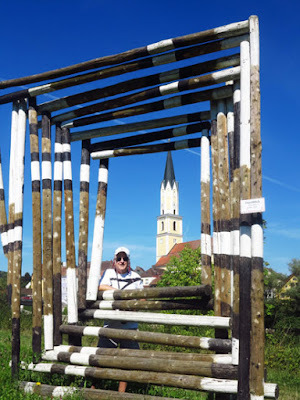 What we found most fascinating were the many pieces of art scattered in the city center (accessed by walking down the main street), and along the Danube River (accessed by a broad waterfront path). 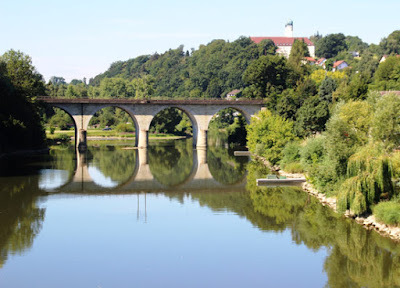 ﻿﻿As avid photographers, we searched for “The Frame Project,” a popular spot on the right bank of the Vils River (across the bridge) for snapping beautiful pictures of the church and clear images of colorful reflections from across the river. "The Frame Project" is a popular picture spot. Among the sculptures we saw in the old town were: St. Sebastian in front of the Catholic Center, St. Florian in front of the City Tower, the well in front of City Hall, “The Book of Wisdom” in front of the Parish Church, “Meeting” in front of the bank, and a modernistic piece called “Jazz” on Vilsvorstadt, a side street. 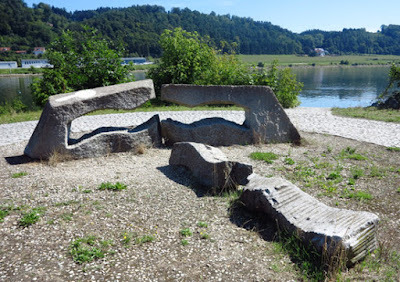 the sculptures for which Vilshofen is noted. Once our interest was piqued, we decided to find additional art pieces pictured in our city brochure. These included “Wave of the Danube meets wave of the Vils River” and “Danube Tree,” a striking piece that represents the Danube from the beginning to the end in the Black Sea with all its side rivers. Larry enjoying his Oktoberfest treats. 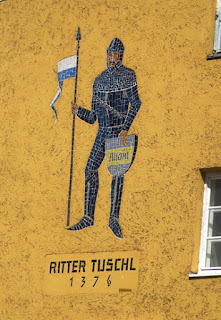 Having enjoyed a delightful “Oktoberfest” celebration (with umpah music, pretzels, and beer) provided the previous night by the friendly folks in Vilshofen, we were glad for the opportunity to spend a pleasant morning wandering through this quaint town before sailing on to Passau.